My daughter got married this weekend. Everything went off without a hitch. It was absolutely beautiful! Just kidding. There were hitches nearly everywhere! That was my lie. A quiet moment between the bride and groom. The bride and groom decided that they would rather budget more for the honeymoon and house fund than to spend it all on just one day, and we took a lot of the tasks on ourselves. Good or bad, what happened that day can be attributed to (or blamed on) us. There were details that didn’t happen exactly as planned (or in some cases, at all), and with all the stress involved, I’m not sure I’d recommend that method, but at the end of the day, it was the fairy tale event they had hoped for. Between the better portion of the wedding party, which included all of my children, family, and friends, everyone worked diligently to transform an old wooden beachside building into a lighted Beauty & the Beast fairy tale wonderland. 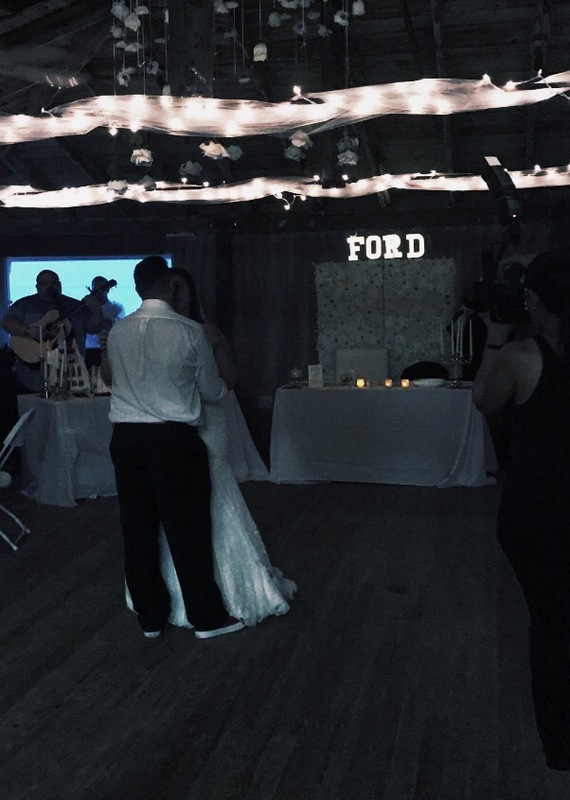 From cooking to cleaning to decorating and everything in between, so many people pulled together to make her dream wedding come true. As for me, I was frazzled beyond belief, and if there is such a thing as a Motherzilla-of-the-Bride, it was me that day. I snapped at so many people, including those I didn’t know well, or at all. [Note: If you were at the receiving end of my barbed tongue, my apologies… I promise, I’m not normally quite so bad.] The valets at the hotel didn’t even ask for my ticket number by the time the weekend was over I had gone in and out of the parking garage so many times, each time wondering what they must be thinking of the various assortment of people and things I was transporting – each kept changing. One of my favorite little details that did happen was the small blue heart my seamstress friend sewed into the inside of my daughter’s dress. K had picked out one of her father’s old blue shirts, and then had B cut out a heart and sew it into the lining of her dress just near her heart. It was her “blue” for the day. Turns out her borrowed was a bit more interesting. Just before her wedding Victoria’s Secret was having a sale and my daughters and I got some super inexpensive new undies. K had put hers somewhere with the express intention of making sure it made it to the hotel where she would be getting dressed. Somehow it never made it, and she grabbed a pair of mine saying “Sorry, Mom. As I kneeled before her in her wedding gown and guided her feet into the leg holes, I had a flashback to potty training so many years ago, and it made me choke up a bit. groom’s father, gave an extremely touching and unexpected tribute to A, however. He spoke of how A’s absence was clearly felt by us all (among other things that I was just too emotional to catch) and I’m honestly not sure that anyone who knew him had a dry eye at that time. A few people (me and the Duchess, for sure) were outright sobbing. It was a good thing I hadn’t had time to do more than a quick make-up application or it would have been completely wasted. The tears flowed again when the groom’s father and mother sang a duet of Can’t Help Falling in Love with You for the couple’s first dance. Not feeling photogenic, but trying to allow pictures anyway. All I can say is I’m glad I took the time to have my hair done professionally, because at least it seemed that I made some effort, although my exact instructions to the hairdresser were “make it look like I tried, but not tried too hard”. Mission accomplished, I’d say. (Now, I can’t say the same for my unshaven legs or unplucked eyebrows, though. *insert eye roll*) Thankfully, all eyes were on the bride and not the hot mess that was her mother. Of all the details that didn’t happen quite the way we planned, there were so many others that did. Some even better than we could have imagined. And despite occasionally feeling as though I was failing at my job, the reassurances we received that the wedding was absolutely beautiful made me feel a bit better. And now that the happily wed couple have started on their incredible honeymoon where among other things, they have booked lunch on the Eiffel Tower, they can relax and not worry about anything that didn’t go quite as anticipated. In the end, though, I know the most important detail fell into place, and my Beauty married her Beast in a wedding by the sea, where I know her Daddy had front row seating. And that’s the only one I cared about.